St Johnstone manager Tommy Wright insists the door is still open for Chris Kane to help provide more goals for the Perth club. Kane is on loan at Queen of the South until January and scored twice in their 5-2 win at Dunfermline. Stefan Scougall's winner against Hamilton was only St Johnstone's sixth goal in their last 10 games. "We're hoping to bring a striker in because it's an area I feel we need to improve," Wright told BBC Scotland. "Chris Kane's a young player with a big future at this club and whether he comes back in the window we'll have to wait and see. "He's already played for us this season so the only club he can stay with [other than St Johnstone] is Queen of the South. "If they want to keep him and he's going to be playing regularly then that might be an option for him. "The whole idea of him going out was to get him games." Scougall's strike in the 1-0 win was his first since joining St Johnstone from Sheffield United in the summer. It came in a game Hamilton had dominated in terms of chances created. "It's a wee bit unfair to say it's a smash and grab," said Wright. "We were under pressure at times and had to defend a lot of crosses into the box, but we did that well and that's part of the job. The goal we scored was excellent. "[Scougall] did great and kept [his] composure. That goal will give him a big boost. It was at the end of a very good move with a good switch of play in it and Stefan calmly puts it away." 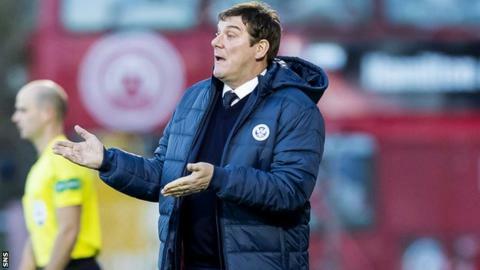 Hamilton Accies manager Martin Canning could not believe they took nothing from the game. Antonio Rojano, David Templeton and Giannis Skondras all had excellent chances to put Accies ahead. "I can't be too critical because we did everything but win the game," he told BBC Scotland. "We've played well, created opportunities, were brave and knocked it about. We had one mistake and we were punished for it. It's frustrating because we deserved so much more from the game. "It's a sore one because it's a mistake. If they have a good bit of quality and they rip you apart and you think that was deserving to win the game, then you can accept that a little bit better. But it's one mistake that's cost us the game."